A family from Hitchin have spoke out after a flat tyre on their car led to a full armed-police raid on their family home. It all began after care service manager Mr Rayat’s Orange BMW experienced a puncture in Hitchin town centre. He was confronted in his drive by a dozen armed officers with dogs and pushed against a wall before being handcuffed. Fishponds Road and then a section of Bunyan Road was closed for over an hour around lunchtime while the police searched Mr Rayat’s home, which has been the family home since 1979. His 17-year-old son Harkeert was also put against the wall and handcuffed. Recalling his ordeal he said that as he unlocked the door, an officer pointed his gun at him telling him to put his hands up. He states he was then grabbed thrown against the wall. “They had me out there on the main road being searched in handcuffs,” said the distraught teen speaking to local press. Mr Rayat 47, was made to wait in a police car while his family who are native to Hitchin having lived there all their lives apart from their mother. They were searched outside in full view of their neighbours and passers by. The raid came following a call made to police about an apparent gunshot which was supposed to have come from Mr Rayat’s Orange car. These allegations then changed when Mr Rayat was wrongly accused of making gesticulations from the vehicle. Mr Rayat he didn’t hear the alleged “pop” from the tyre himself, but assumes that this must have come from the puncture they noticed following a trip to the bank in the high street. Mr Rayat says that despite heightened security in the country at the moment, he can’t believe that something as drastic as this happened just because someone reported a "pop". Mr Rayat’s 20- year old daughter Manmeet Kaur who went to Hitchin Girl’s School said that the neighbours were laughing in the street, which caused a great deal of embarrassment for the family. 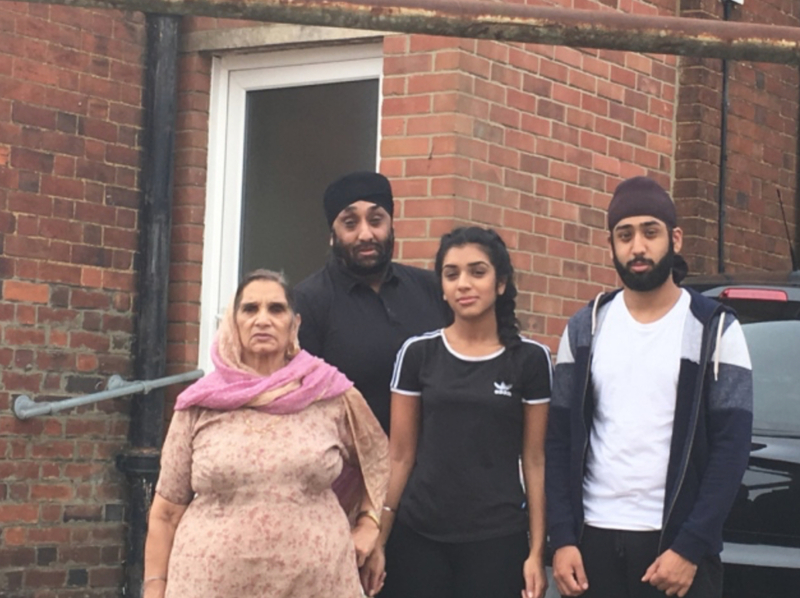 The family are particularly upset that officers ignored their plea to take their shoes off before entering a special room upstairs filled with religious Sikh items and texts, the officers left visible boot prints. Mr Rayat explained how the treatment of their religious room was a ‘massive insult’ and ‘a direct attack on their religion’. A police spokeswoman told the local press: “Officers have a duty to act on information received and any reports involving firearms are taken very seriously. “Police responded to a call at 12.09pm today from a member of the public who stated they had seen two men inside a car in Bunyan Road holding what they believed to be a firearm. “Officers from the Bedfordshire, Cambridgeshire and Hertfordshire (BCH) Armed Policing Unit, the BCH Dog Unit and North Herts Intervention attended the location. “Armed officers detained a man and entered a property before carrying out a search to ensure there were no people inside the address with a firearm. “A search of the car was also carried out. It was quickly established that there were no firearms present and everything was in order. “We would like to stress that the occupants of the address searched have not committed any offences, nor were any arrests made.